Earlier today in the Philippines, Pinoy fans saw the really promising Jack Tepora (17-0, 12) extend his perfect record, and pick up the WBO Asia Pacific Youth Super Bantamweight title. 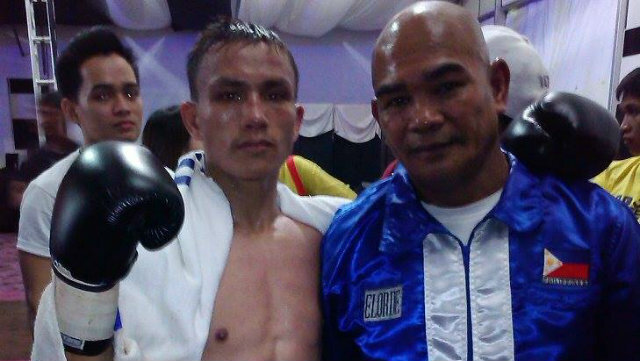 The touted Filipino scored a 5th round KO win Jason Tinampay (7-3, 6) on an Omega Boxing Promotions card in Cebu City. The early stages saw the two men trying to measure each other, with Tepora taking the centre of the ring and Tinampay fighting from the outside. Unfortunately for Tinampay his game plan wasn't a winning one with Tepora cutting the ring off with ease. By the second round Tepora was breaking the body of Tinampay and the power shots were clearly taking their effect on the over-matched foe. Despite looking in control Tepora was reminded that he was in a fight part way through round 3 when Tinampay landed a solid right hand that caught his attention. That however seemed to just make Tepora angry and in the following round Tepora, adpating to the desperate shots of Tinampay, started to time his spiteful counters. With Tinampay becoming more desperate he began to leave defensive holds and one of those openings was Tinampay being punished with Tepora unloading a vicious combination in round 5 that forced the finish. In the co-feature of the show fans got a Flyweight treat as former world title challenger Vergilio Silvano (21-6-1, 12) engaged in a 10 round war with Fernando Ocon (13-11-1, 5). The bout was a war of attrition and was competitive through out, with Silvano just doing enough to claim the win, with scores of 96-94, twice, and 97-93. Over the past few days it has been announced that former IBF Minimumweight title challenger Vergilio Silvano (19-4-1, 11) will be fighting against the sensational Francisco Rodriguez Jr (16-2, 11) in a 10 round non-title bout on November 15th in a bout that will act as part of a deep under-card on the upcoming Pinoy Pride show in Cebu City. Rodriguez, a unified champion at Minimumweight, has really made his name this year with major wins over two Asian fighters. The first of those came when he claimed the WBO title with a stoppage victory over Merlito Sabillo before he then unified the crown with the IBF title courtesy of an exceptional win over Katsunari Takayama in a FOTY contender. We are suspecting that Rodriguez will vacate both world titles after this bout and it appears the IBF have already opened talks for former champion Katsunari Takayama to fight for the title. As for the WBO title that's likely to be decided either later this year or early next year and with the WBO rankings set to be updated we'd not be shocked to see Kosei Tanaka's name in the running for that world title fight following his sensational victory over Ryuji Hara earlier this week. When we suggested we were really excited about the OPBF Light Flyweight title fight between the world ranked Jonathan Taconing (18-2-1, 15), pictured with his trainer, and Vergilio Silvano (18-4-1, 10) we really weren't joking. It had all the ingredients of a really, really good fight. What had the ingredients to be great turned out to be even better than we'd have imagined in our wildest dreams as the two Filipino warriors went toe-to-toe in an all out war that will go down in Filipino boxing folk lore. The fight started well for Silvano who appeared to win the opening round with his jabs and uppercuts firing well from the off. The second round however saw the pace picking up as Taconing began to force the issue, turning the fight into a real battle. From then on it became a slug fest with both men trading bombs through the middle rounds. Unfortunately for Silvano the war was going against him, as was the officiating which saw him being deducted two point for illegal blows. This had seen him fall well behind on the score cards and he clearly knew he was chasing the fight going into the later rounds. Knowing he was up Taconing seemed to take round 10 off, catching his breath before going into the championship rounds. This seemed to open the door for Silvano who came on strong trying to turn the fight around in his favour. Unfortunately for Silvano he was unable to have the same success in the 11th round as as Taconing re-found his fire and forced a stoppage as he unloaded vicious combinations on is compatriot before forcing Silvano's corner to save their man. The bout may well go down as one of the best Asian fights this year and we're really hoping to see footage of it leak around the interest sooner rather than later. Some shows just seem to get better and better and the Kameda promoted show for December 3rd is one such show. The first news we had from it was that Daiki Kameda would defend his IBF Super Flyweight title against WBA champion Liborio Solis in a very interesting IBF/WBA unification bout. That bout alone seemed to be big news but then just days later we heard that there had been a second notable contests added to the show as IBF Minimumweight champion Katsunari Takayama was announced to defend against Vergilio Silvano. It would have been fair enough to have assumed that would have been the final big announcement for the show. Surprisingly however the Kameda's had another addition, the first defense by the WBO Bantamweight champion Tomoki Kameda. The youngest of the Kameda trio will be fighting the unbeaten Immanuel Naidjala of Namibia. A man that we will admit to knowing very, very little about. In fact all we really know is that he is highly ranked by the WBO (#6) and has never fought outside of his homeland. In fact Naidjala has only fought outside of Windhoek once in his 18 contests. With a record of 17-0-1 (11) Naidjala looks like a credible challenger. Though we'd be very much shocked Tomoki, 28-0 (18), lost his title here especially in his first defense. Amazingly a win for Tomoki will be the first ever successful WBO world title defense by a Japanese fighter, and we believe the first ever successful WBO world title defense, by anyone, in Japan*. *We know Fernando Montiel was the WBO champion when he defeated Hozumi Hasegawa, however Montiel's title wasn't on the line in that contest.